JEE Main Application Form 2019 (For April) for the second attempt has ended on 7th March 2019. The slot for filling JEE Main Application Form for April month lasted between 8th February to 7th March 2019. Candidates can rectify the errors between 11th March to 15th March 2019. And, candidates belonging to EWS category can also update their details during the same. The National Testing Agency (NTA) will be conducting JEE Main 2019. The Joint Entrance Examination (JEE) Main is one of the most competitive and toughest exams to crack in the world. JEE Main is held annually for admission in undergraduate engineering (B.Tech) & architecture/planning (B.Arch / B.Plan) courses offered by IITs, NITs, IIITs, etc. So the candidates who wish to secure an admission in their dream college must fill up the JEE Main Application form 2019. JEE Main Exam is around the corner! Are you worried about the JEE Main 2019 paper? We have your back! India’s best data scientists have analyzed the JEE Main papers of the last 22 years on various parameters like the difficulty level, syllabus coverage, ideal time for each question, questions involved with multiple concepts, repetitive nature of concepts, etc. Keeping these parameters in mind, they have generated the JEE Main Predicted Question Paper that is verified by the senior academic experts from across the country. Embibe’s JEE Main January Predicted Question Paper is India’s first and only predicted test powered by AI and data science, having 95% chapter similarity to the actual JEE Main January question paper. Form Correction & EWS Category Update window is open from March 11, 2019, to March 15, 2019. Public Notice For Duplicate Candidates: Candidates must register themselves only once and those candidates who are registering twice will be rejected. JEE Main Mock Tests: NTA has launched a mobile app for mock tests. JEE Main Application Form Last Date: The last date to fill the JEE Main Application Form is 7th March by 11:30 PM. Also, it is mandatory for the candidates to mention the category. As it will be useful for them to access the reservation made for admissions into Central educational institutes. Educational Qualification: At least five subjects in Class 12th / Qualifying Examination (QE) and Candidates with only four subjects are not permitted to write JEE Main 2019. Year of Appearance in QE: Candidates who have passed their Class 12th Exam or any equivalent QE in 2017 or 2018. Those appearing in their Class 12th Exam or any equivalent QE in 2019 are also eligible. How To Register For JEE Main April Exam? Step 1: Visit the official website of JEE Main: jeemain.nic.in. Step 3: The page will be directed, now click on proceed to apply online. 5. Step 5: Click on Register. 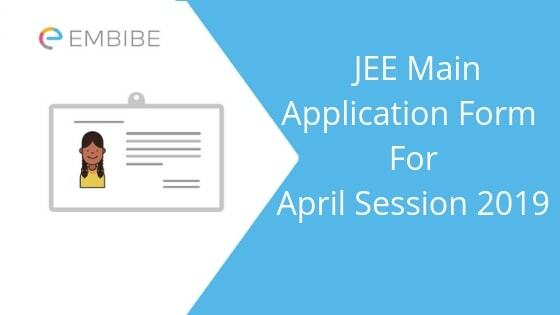 How To Fill JEE Main Application Form For April Session? Registration & Authentication: Initially the candidate must have to register themselves with the officials by providing the necessary details. Filling Details In Online Application Form: Now login with the help of your credentials which you have received while registering. Enter all the required details in the JEE Main Application Form. Uploading Documents: Now upload all the necessary documents such as scanned photograph & signature as described. Process The JEE Main Registration Fee: Now process the application fee and the JEE Main registration fee for April session can be made either through online/offline mode. Printout The Confirmation Page: Now click on ‘Submit’, after which you will receive acknowledgment page or confirmation. Candidates are advised to take the printout of this confirmation page. NTA has opened a one time facility of form correction window from March 11, 2019, to March 15, 2019 for both january and April applicants of JEE Main. Through this facility candidates will be able to correct all their details except for the exam cities they have applied for. The application form correction window is only applicable to the students who have successfully completed the application form. a. Visit the official website at jeemain.nic.in. c. You will be redirected to a page where you must fill in your login details such as your application number, password, Security pin, and pin. (Only registered candidates will possess all these details). d. Click the” login “ button after filling in the required details. e. Make necessary changes to the application form and cross-check them once again before submitting. f. Post verification of your details, click on Submit button. The corrections will be made to your JEE Main application form 2019 . Candidates can refer to this article for more details on the image correction from below. The additional fee (if applicable) should be paid by the candidates either through credit/debit card/Ewallet (SBI buddy/Paytm) or through e-challan generated during the online correction by cash in the Syndicate/Canara/ICICI Bank during March 2019. Fill all the required details like Application Number, Password, and security code. Select the images with correct specification and upload them. At Embibe, we have ensured that the aspirants avail mock tests free of cost. We suggest you attempt our mock tests and evaluate yourself before appearing for the examination this year. 2. On the sign in box for registered candidates, click on “I can’t access my account?”. 3. If you have forgotten your password, select “I forgot my password” and then click on “Continue”. 4. You will be given 3 options to reset your password. Choose any. 5. Enter the details in the specified fields and click on “Submit”. Question 1: Can Aadhaar Number also be updated? Answers: Yes, candidates will get the opportunity to edit Aadhaar details in the application form. Question 2: I was unable to book the date for online examination after paying the fees. Now, how will the date and session be determined? Answers: In this case, the exam date and slot will be assigned randomly. The details of it will be informed by the admit card. Question 3: In which particulars, JEE Mains correction in application form allowed? Answers: Candidates can modify the particulars such as paper-1 to paper-2 and vice-versa or select both papers of his/her application form. The balance fee (if any) will be charged during that correction period. Question 4: If a candidate has applied for paper-1 and paper-2 but do not want to appear for any one of the papers? Answers: It is no compulsion to appear for both the papers. Candidate can opt for any of the paper of his/her choice but its application fee will not be refunded. At Embibe, you can solve more than 60,000 JEE Main practice questions for free. These questions have been handpicked from all the best books for JEE Main. You can also take free JEE Main mock test series on Embibe. There are tests of various types which are of the same level as the actual JEE Main exam. Embibe also provides personalized guidance for your JEE Main preparation. RANKUP, Embibe’s Artificial Intelligence-powered tool provides step by step guidance and looks after your overall development, which, in turn, guarantees score improvement by up to 60 percent in just 10 tests. So what are you waiting for? We hope this detailed article on the JEE Main Application Form helps you. If you have any query regarding this article or JEE Main Application form filling process, drop a comment below and we will get back to you.